We stayed at the beautiful Sheraton Krabi on the 1.8-kilometer Klong Muang Beach for a week in January of this year. Sure, the food was pretty good at the resort, but we wanted to venture out and find some grub that was a little more authentic. Luckily for us, there were a lot of restaurants right outside the gates of the resort. There were a good variety of seafood, Indian, Italian, and of course plenty of Thai restaurants to choose from. 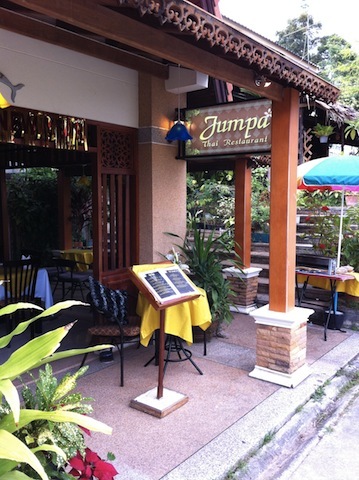 We picked Jumpa Thai Restaurant at the Klongmoung Plaza as their menu looked promising. Well, we sure made the right decision – wow the best Pad Thai and coconut curry we’ve ever tasted! We even had dinner at Jumpa two nights in a row, it was that good. 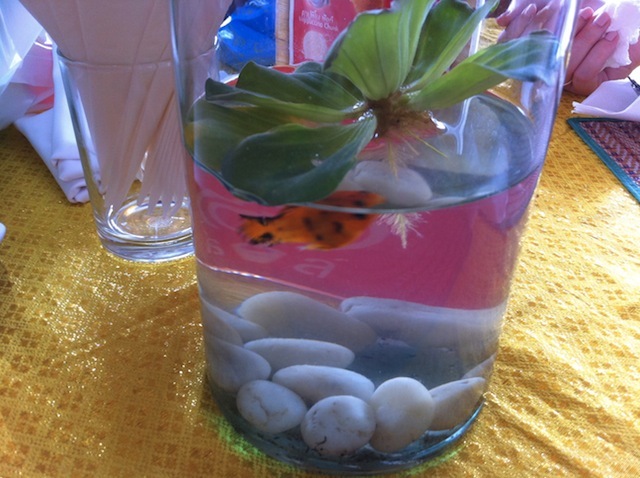 A little goldfish as our table’s centerpiece. 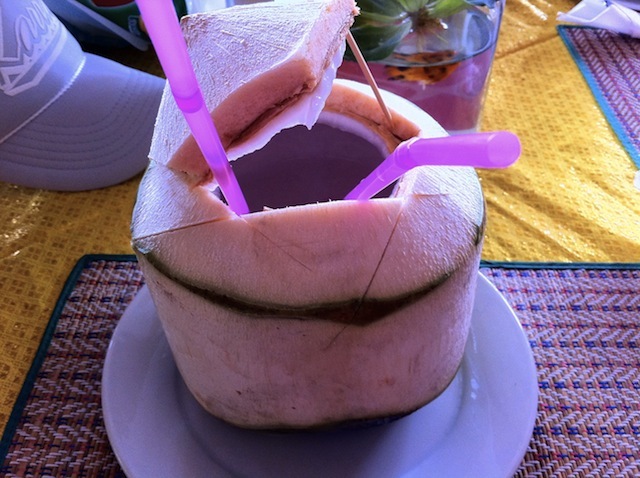 Incredibly fresh and refreshing young coconut. 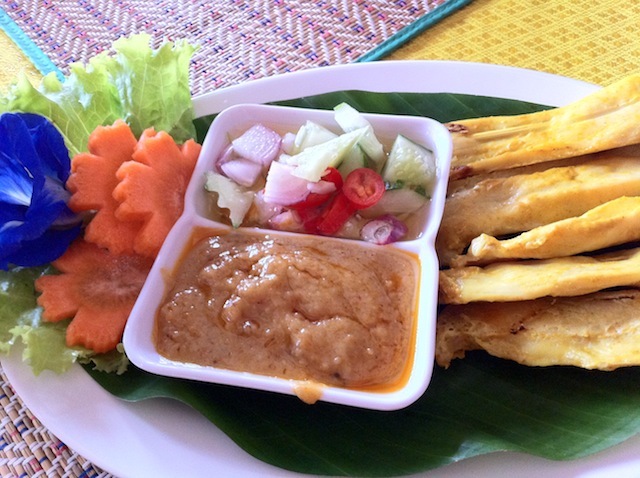 Chicken satay with homemade peanut sauce. 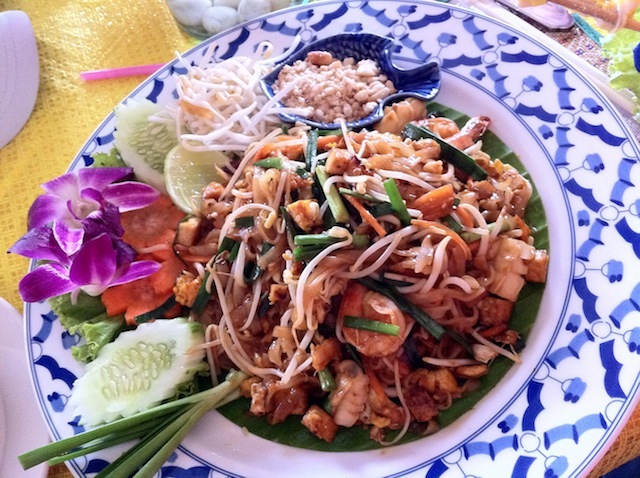 The most delicious seafood Pad Thai ever – look at that presentation! 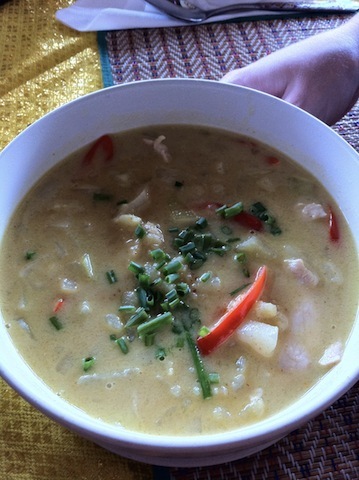 Chicken coconut curry with potato was gloriously aromatic. The flavors were so intense, without being overpowering, and the ingredients were exceptionally fresh. We’ve visited other areas in Thailand (i.e. Bangkok, Phuket, Pataya, etc.) but haven’t had food this delicious. Now, you’re thinking, Jumpa’s near a 5 star hotel, surely the prices must have been jacked up. Well for us, the food was cheap! A huge plate of Pad Thai was only $3USD – a fifth of what we pay at home for dish that doesn’t even compare. Excellent service, amazing food, beautiful presentation, lovely surroundings, great tunes on their stereo, and we even had a little goldfish on our table. What more could you ask for!